In partnership with United Way of the Lower Mainland, Maple Ridge – Pitt Meadows School District No. 42 has embarked on an exciting new path for our community, focusing on sustainable, educational and fun after-school programs. The after-school programs we offer provide expanded learning opportunities both educationally and emotionally to help our children and youth to be ready, able and motivated to learn. Physical Activity: Programs that stress the development of fundamental movement skills and sport skills that permit a child to move confidently and with control. 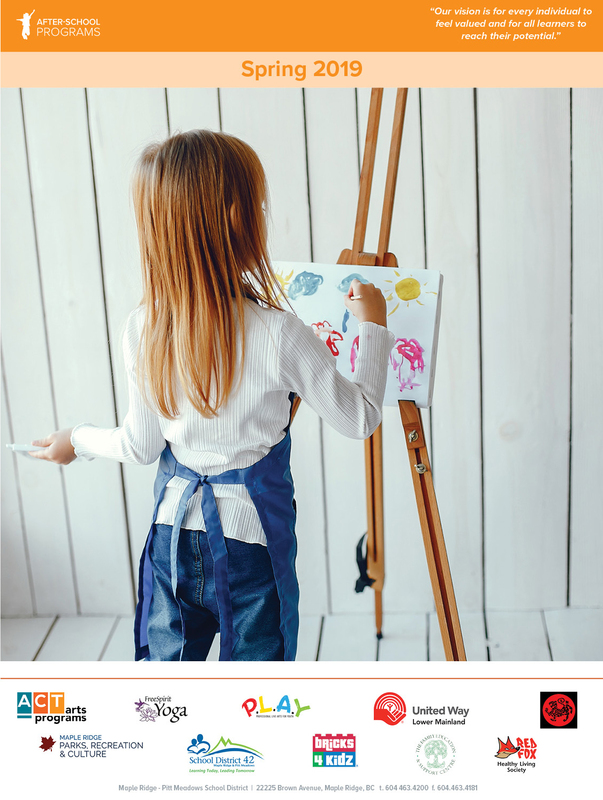 Arts and Exploration: Programs that allow children to develop their creativity and express themselves through a variety of visual and performing arts. Literacy: Out of school programs that support school BC curriculum. Leadership: Programs that include topics like communication skills, group dynamics, self awareness and teach life and leadership skills. Social Responsibility: Programs that create opportunities for children to explore their community, solve problems in peaceful ways, value diversity and human rights, and exercise democratic rights and responsibilities. Resources for Children, Youth and Families: Connections to information and services that are supports for families. Health and Wellness: Programs and services that support healthy child youth and family development. The Maple Ridge – Pitt Meadows School District has partnered with Maple Ridge Parks, Recreation & Culture to offer a variety of after-school programs within our elementary schools during the 2016-17 school year. These programs are designed to encourage and support children with their development in play, fitness, creativity and sense of curiosity. A licensed after school program for K-7 offered at Albion, Eric Langton, Hammond, Highland Park, Laity View and Yennadon elementary schools from 2:20 pm to 6 pm. An unlicensed recreation-based after school program for Grades 1-7 offered at Blue Mountain Elementary from 2:30 pm to 5:30 pm. To learn more about the Active Kids Club and Play Adventures programs click here.